Kids and fans alike can imagine the biggest battles and missions in the Star Wars saga with figures from The Black Series! With exquisite features and decoration, this series embodies the quality and realism that Star Wars devotees love. At long last, Rey has found Luke Skywalker, the last Jedi Master in the galaxy. Hoping to find a hero of legend, she must unlearn what she has learned as Skywalker challenges her expectations. 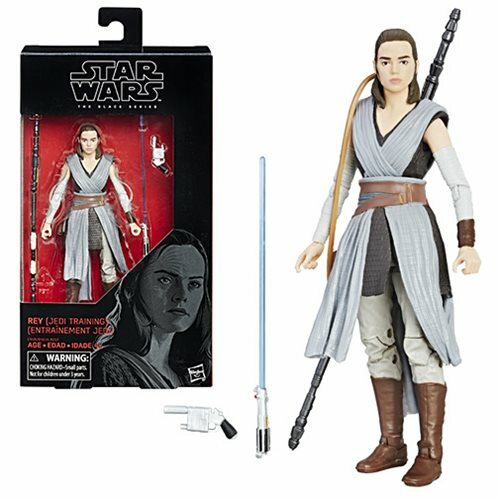 This 6-inch-scale Rey (Jedi Training) figure is carefully detailed to look like the heroine from Star Wars: The Last Jedi. This figure features premium detail and multiple points of articulation, and includes 3 character-specific accessories. Ages 4 and up.